Intuition suggested we should sit in a coach and drive straight to the hotel – without any adventures. But they persuaded us. First at the airport they stuffed us and our things into two cars – to drive to the train station. Then we drove at a speed at which rickshaws overtook us at bends, and passenger buses sped past like Ferraris. At the station our guide and translator suddenly started rushing around, but in vain – the train had left, in his words, 10 minutes ago. We spent an hour discussing what to do next, but the attempt to get a coach fell through, and they suggested we waited 4 hours for the next train. So we waited. A lot of people live in China. Along the way the train, that can achieve speeds of up to 250 km/h, kept stopping to pick up all-comers. It covered a distance of 200 km in 3.5 hours. Finally, a coach was waiting for us in the station, and 30 minutes later we were in the hotel. “Tired but happy”, as they say – banal, but extremely accurate. The hotel is high class, and it’s cool and quiet in the rooms. After a quiet team dinner each of us went off to readjust to the local time. Some managed, and got up for breakfast the next day, while others didn’t even make it to lunch. We’ve still got a few days until the opening, but the teams are already gathering, which emphasises once more how serious the favourites are, and how much the event means. The RCF website has also being keeping tabs on the Russian team’s preparation for the event in China, which included a week spent at the Ognikovo training camp 50 km from Moscow. Vladimir Barsky produced a remarkable photo report from which I’ve taken most of the photos below. It also included an interview with Peter Svidler. 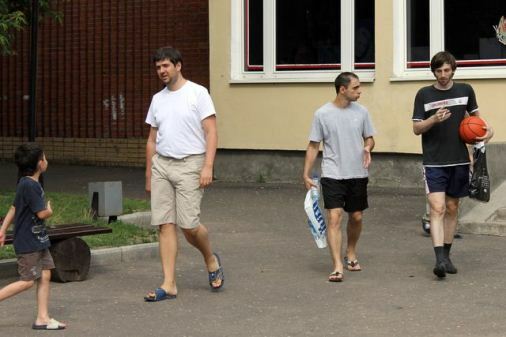 Note that when Svidler talks about teaching kids he’s referring to his winter session for the Russian Chess Federation’s grandmaster school (as captured by Anna Burtasova in another photo report). The project has been somewhat controversial, as people have argued both that children should be taught by experienced trainers, and that top-GMs have more important things to spend their time on (though when e.g. Nakamura is playing in the World Series of Poker a week before Dortmund you do wonder!). 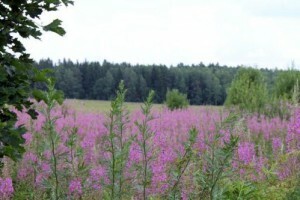 Are you familiar with Ognikovo? No, not really. I was here with the kids in January, but I’d never been before that. And what are the conditions like? If there was a mobile phone reception then it would be great. There’s not too much lacking except that people with the misfortune of having the wrong mobile phone operator are forced to “beg” their colleagues to phone anywhere. That can be awkward at times, but it’s not a matter of life or death. Haha! We’re completely cut off from the outside world. In a way the visit to the medical examination turned out to be a blessing in disguise, as it was possible to have a good talk to my family and those back home. The room and food – is everything ok? Normal. I can’t say that each day we have something “gourmet”, but it’s perfectly satisfactory. The air’s wonderful here, and there are trees and water near by – the nature’s great! Perhaps they don’t want to darken the landscape with mobile phone masts – which in that case would be understandable. Sometimes you want to talk to your family, but otherwise it’s all fine. How do the days pass at the training camp? Breakfast, some sort of work on yourself, lunch, sport, dinner, work on yourself. And how did teaching the kids go? 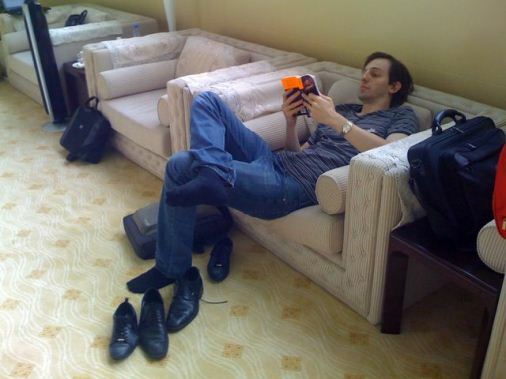 Evgeny Tomashevsky and I ended up absolutely exhausted back then. The pair of us had to teach 16 children from the younger and middle school classes, and by evening we were pale shadows of ourselves. I remember when we’d discussed the sessions on Skype and I said: “Perhaps in the evenings we can look at something”. He replied: “I’d love to!” We imagined we’d be able to push the pieces. However, by 6 or 7 in the evening, when the sessions with the children ended, the very thought of moving some chess pieces about seemed absolutely absurd! The children were cute, however, and it was pleasant and interesting to talk to them. Overall, I had a positive impression, but I was just crazily tired. Did you have to do a lot of preparation? I had to give some lectures and look at their games. There were all very active and bright-eyed! Have you been to Ningbo before? 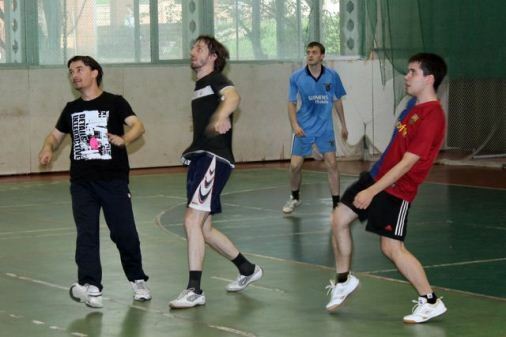 I played in the Russia – China match there. In 2008 or 2009, I don’t remember precisely – all the tournaments merge into one for me. What do you expect from the championship? The same as always. It’s clear that if we all play well then we’ll be favourites. Not the only ones, as the Ukrainian and Azerbaijan teams also have brilliant line-ups. Of course, “the ball is round”, and it’ll all be decided in 2 or 3 key encounters. The tournament will be very difficult, but which of us can remember easy ones in living memory, and I don’t think we’re going to start getting them now. 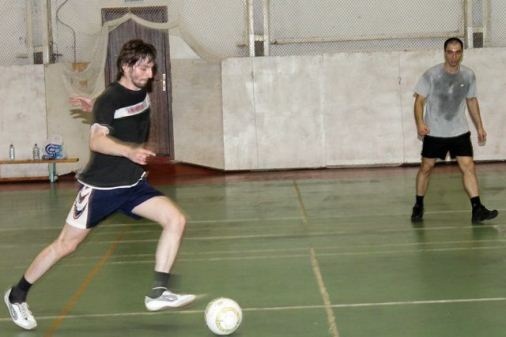 Of course, we’re capable of winning the championship if we all play well. Before that November and December were completely crazy, and people were barely conscious by the time they got to the Superfinal. The autumn and winter schedule was always totally mad, so now they’ve slightly unloaded winter at the cost of packing the summer. No problem – we’re used to it! Of course, it would be good if everything was more balanced and spring and the start of summer were busier, then you could take some of the strain away off autumn and winter. But it seems there’s been no progress in that direction, and it’s not clear who to blame. There’s an official FIDE calendar without very many gaps, and you have to work around it. This year the switch from December to August was… I can’t say it was directly my fault, but I was one of the indirect causes of it happening. That’s because in December there’ll be a tournament in China, in which Sasha [Alexander Grischuk], Sergey Karjakin and myself would like to play, and the federation tried to help us out – rather than it being the other way around. I definitely can’t complain, as in many ways the switch happened at the “request of the workers”. So that’s the situation. First China, then the Superfinal, then in a week and a half – the World Cup. That’s probably not entirely healthy, but then it’ll be easier in December. Spot the ball! 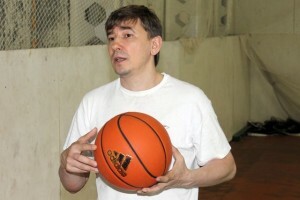 Morozevich helped out in the training camp. Recently there was some news about the modernisation of FIDE. What do you think about that idea? I suspect I’m not up to date, and I don’t know the details you’re talking about. They’re planning to put the emphasis on rapid and blitz chess. It seems to me that in the early stages you can completely ignore FIDE’s declarative statements, which is what I’m busy doing just now. When the declarative statements grow into some sort of changes in the schedule and it’s possible to see what they had in mind then there’ll be something to talk about. In principle, I support the idea of increasing the number of tournaments in rapid and blitz chess, as it’s interesting for the spectators and draws attention. Right now we’re not in a position to reject any ideas that might draw attention to chess. They might be right, essentially. It’s a different story, however, and we’ve long since become accustomed to it, that far from all of FIDE’s ideas ever get implemented. Let’s wait and see! Ilyumzhinov said that the matches in Kazan made a depressing impression on people. Perhaps for non-specialists the matches really did create such an impression. I wouldn’t say depressing – they weren’t as bad as people are inclined to imagine. As a person who was on the inside of that process, I can say the following: people are inclined to underestimate a) how much was at stake for the participants, and b) to what degree the format of three matches in a row puts absolutely brutal limits on what you can allow yourself to do in the opening. I don’t want to represent the position of “Grischuk’s Team”, but if over three matches everyone exclusively plays the Queen’s Gambit against you, and for 1. e4 they’ve got the Petroff in reserve and won’t be afraid to use it, then of course it becomes less of a spectacle. But it’s not clear what you can do about that. If the matches had been spread out over a period of time then it would have been possible to prepare for that to some degree. But in the situation Sasha found himself in… Yes, the spectators were occasionally stunned by what went on, but the weight he had to lift – it really was a weight. In general, is it still too soon to bury classical chess? Yes, it’s almost always too soon to bury anything or anyone, except in cases when you can confirm the death of the individual. I perfectly understand the critics. When the process is criticized by people who don’t understand a thing then that doesn’t provoke any particularly strong emotions. Well, they don’t understand! But some of the criticism has come from people who could think a little about why things happened precisely the way they did and not otherwise. All of that wasn’t, from my point of view, entirely justified. Have a look, for example, at the Kramnik – Radjabov match, in which the Queen’s Gambit was played with both colours. Vladimir Borisovich himself at some point started to play for a draw with White and wait for blitz. People didn’t want to draw conclusions, and then when they see quick draws in the Kramnik – Grischuk and Grischuk – Gelfand matches they think: that’s where the guilty party lies! And that’s what’s annoying: when people could understand but don’t want to. They could think about it for 30 seconds and restrain their righteous anger. But what can you say? Good luck to them! 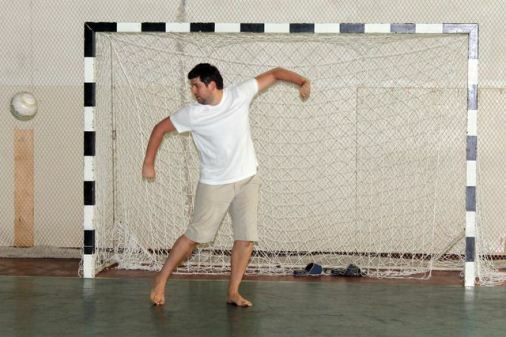 The person in the last photo is a goalkeeper or an egyptian dancer?! so you’re not gonna do the live commentary here?? No, sorry – maybe try installing a new browser!? (e.g. Chrome?) I’ve actually got permission to put the text up here after the live commentary is over, but I’m not sure if I’ll find the time! @chandler: I had to reload the whychess stream a few times before it worked for me. It takes a while to load when it’s busy. 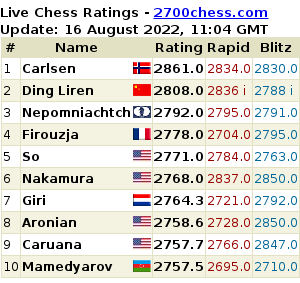 almost missed the aronian part2 since i only look at columns on left. no time to write up the usual preview, I guess. WhyChess has ruined my life! No interviews of Bareev, or the players. And couldn’t read Shipov either!! This site’s got a mistress on the side, and I don’t like it one bit. This website has been a landing area every day as part of my daily ritual. Will you be full time with whychess.org henceforth? OK… atleast keep telling you wife the things yuo do with your mistress. i.e. put up the links to ALL the chess stuff you translate some place on this site (a dedicated page for mistress-stuff). Reason is that whychess has a lot stuff i don’t care about; but i’m interested in anything you do translate. So do make a collection of your articles’ links and keep updating it asap. That something you can do despite your busy schedule?? I think a link to whychess news session in prominence would do the trick. Very nice job there, Colin! Fireblade – I’m hoping WhyChess will be more or less full time, but I still want to do things with this site. I really just have been crazily busy for the last couple of weeks! chandler – It’s a real shame you can’t access the Shipov commentaries, as I think the new system is much better for readers (and I can also translate faster as I’m not editing the page as I go along). chandler, what browser/version are you using? mishan: your work is much appreciated, thanks a lot and I hope you keep it up!